BOSTON -- A large police presence greeted runners and spectators filtering in Monday morning for the Boston Marathon, a year after a pair of homemade pressure-cooker bombs near the finish line killed three people and wounded more than 260 others. A moment of silence was observed and "America the Beautiful" was played over a loudspeaker before the race began for mobility-impaired marathoners. The elite men and women runners started later in the morning. Yet for all the security, the atmosphere was calm and friendly. "I think everybody is being very pleasant," said Jean Bertschman, a Hopkinton resident who comes to watch the start of the marathon most years and had never seen anything close to this level of security. "I think it's going to be a very good race." Buses bearing the message "Boston Strong" dropped off runners. A banner on one building read: "You are Boston Strong. You Earned This." Spectators went through tight security checkpoints before being allowed near Hopkinton Common. For years, state and local officials have conducted a "tabletop exercise" before the Boston Marathon, a meeting that allows them to study a map of the 26.2-mile course from Hopkinton to Boston's Copley Square and plan for emergencies that could arise during the race. So many new people needed to attend the session this year that they moved it from the state's emergency bunker in Framingham to the a convention center in the city. The crowd grew from what usually is about 100 to more than 450, according to Boston Athletic Association executive director Tom Grilk, who is in charge of organizing the race. One year after a pair of homemade pressure cooker bombs killed three people and wounded more than 260 others, turning a day of athletic triumph into one of tragedy, the Boston Marathon returns to the streets on Monday. For the 118th edition of the world's oldest annual marathon, security along the course will be tighter than ever. "There'll be considerably more police presence," Massachusetts Gov. Deval Patrick said on CBS' "Face the Nation" on Sunday. "But we also don't want to have it, you know, kind of a race through a militarized zone. So it's about striking a balance, and I think we have struck that balance." Boston Police Commissioner Bill Evans told CBS News' Jeff Glor the challenges of properly policing the 26.2-mile race are considerable. "This is a soft target," Evans said. "There's 8 cities and towns here that are involved." In addition to the thousands of extra uniformed officers added to the security effort, "we're gonna have a lot of undercover assets working the crowd," Evans said. Runners attending the event will have to use clear plastic bags for their belongings, and fans hoping to watch near the finish line are encouraged to leave strollers and backpacks behind. More than 100 cameras have been installed along the route in Boston, and 50 or so "observation points" will be set up around the finish line "to monitor the crowd," the Boston Athletic Association said. Patrick said there have been no specific threats against the race or the city for the Massachusetts holiday of Patriots' Day. Massachusetts State Police are adding eyes in the sky for the race, reports CBS Boston. Last year, they had one helicopter flying along the route. This year, state police will have four, and they'll be flying throughout the day. The choppers have high-powered and infrared cameras that send crucial information down to officers on the ground. 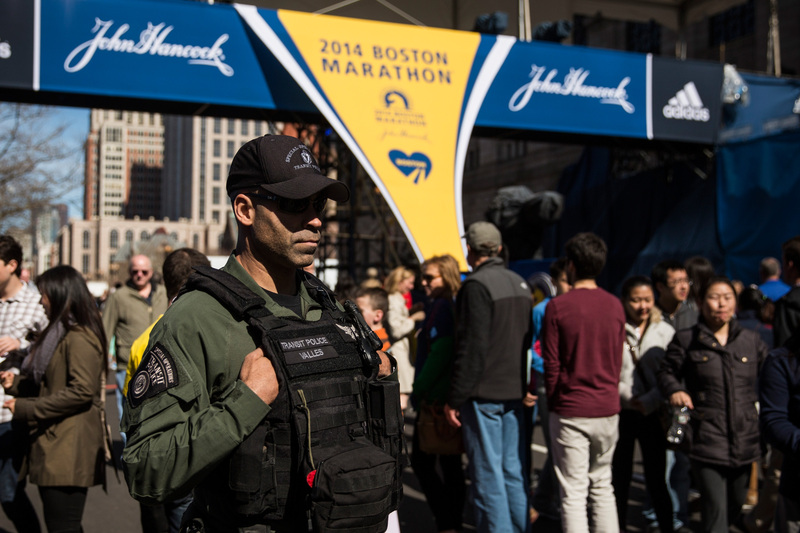 The technology was in place during last year's search for the marathon bombers. About 36,000 runners have registered for the race - the second-largest field in its history, many of them coming to show support for the event and the city that was shocked by the attack on its signature sporting event. Race organizers expanded the field from its recent cap of 27,000 to make room for more than 5,000 runners who were still on the course at the time of the explosions, for friends and relatives of the victims and for those who made the case that they were "profoundly impacted" by the attack. Jeptoo, who also won the race in 2006, said she is hoping for a third victory - and one she can enjoy.